Congratulations to the winners of the last contest. John S. from Iowa City, IA won Death in the Stars. Carola Dunn's The Corpse at the Crystal Palace goes to Robin C. from Ashtabula, OH. The books are going out in the mail today. This week, I'm giving away copies of book that feature the police working with an outside partner. I have two copies of each book, so there will be four winners. The latest Monkeewrench book is P.J. 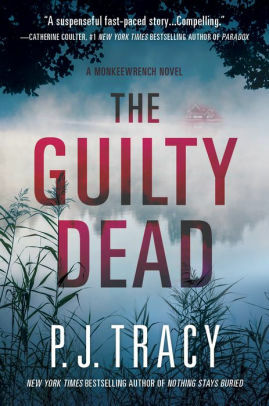 Tracy's The Guilty Dead. Minneapolis police detectives Leo Magozzi and Gino Rolseth are investigating the death of a philanthropist. But, when they team up with the software experts at Monkeewrench, they discover a link between that death and a larger plot. 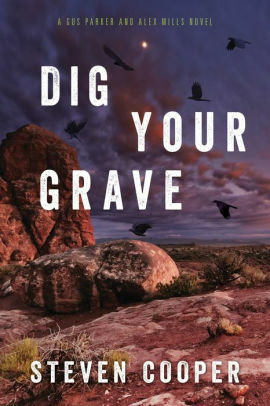 Or, you could head to Arizona for Steven Cooper's Dig Your Grave. Phoenix Police Detective Alex Mills doesn't hesitate to ask for help from a friend who is a psychic, Gus Parker. Several prominent victims have been discovered in graves they seem to have dug themselves. Ghoulish signs warn of more deaths to come so Mills is going to need Gus' help. And, then Gus disappears. Which book do you want to win? You can enter to win both, but I need separate entries. Email me at Lesa.Holstine@gmail.com. Your subject line should read either "Win The Guilty Dead" or "Win Dig Your Grave." Please include your name and mailing address. The giveaway will end Thursday, November 15 at 5 PM CT. Entries from the U.S. only, please. I love the Monkeewrench crew. I've not heard of the other author but the book sounds interesting. Thank you for the chance to win! I love the Monkeewrench crew, Caryn, but I also love the police in that series. They make a good team. Good luck!